It is officially pie season. Pumpkin, apple, pecan…you name it, we’re making it! In past years, we gave you a comprehensive guide to making the perfect pie crust. This time, we are focusing in on what could possibly go wrong, and how to nip that problem in the bud. So what happens when you followed our directions to a tee, yet the pie crust lost some of it’s shape in the oven? First of all, you eat it. Even the less lovely crusts usually still taste great. Shrug it off and learn from the experience. Carry the Weight: Prebaked, or blind baked crusts suffer the most. The filling seems to keep it in place somewhat, even when it wants to shrivel. Make sure that crusts that require pre-baking are properly wieghted. Cover the pie with foil or parchment paper, and then fill it with pie weights or beans. Bake it for the prescribed amount of time, and then gently remove the weights and the lining, and place it back into the oven to brown. Be careful not to pull the liner off too quickly, taking a hunk of hot, partially baked crust with it. Prick It: To avoid the crust bubbling up, prick it in multiple places with a fork. This will allow the air to escape, and keep it from getting soggy in the process. It’s A Stretch: When rolling the dough and placing it in the pan, don’t stretch the dough to fit. Instead, cut the rolled dough larger than you need it to be, settle the center part into the bottom and sides of the pie plate, and then give a little nudge towards the center before trimming off the excess. The dough is slightly elastic, and if it is stretched, it will eventually snap back. Tucking the excess under and crimping it, or adding a decorative border will give it some heft and keep it from shriveling. Just Chill: Just like us, the dough needs to relax and chill. In this case, it should be done in the refrigerator. Think about butter, one of the prime components of a pie crust. It expands when it is warm and soft, and contracts when it is cold and hard. Chilling the crust allows the butter to solidify. 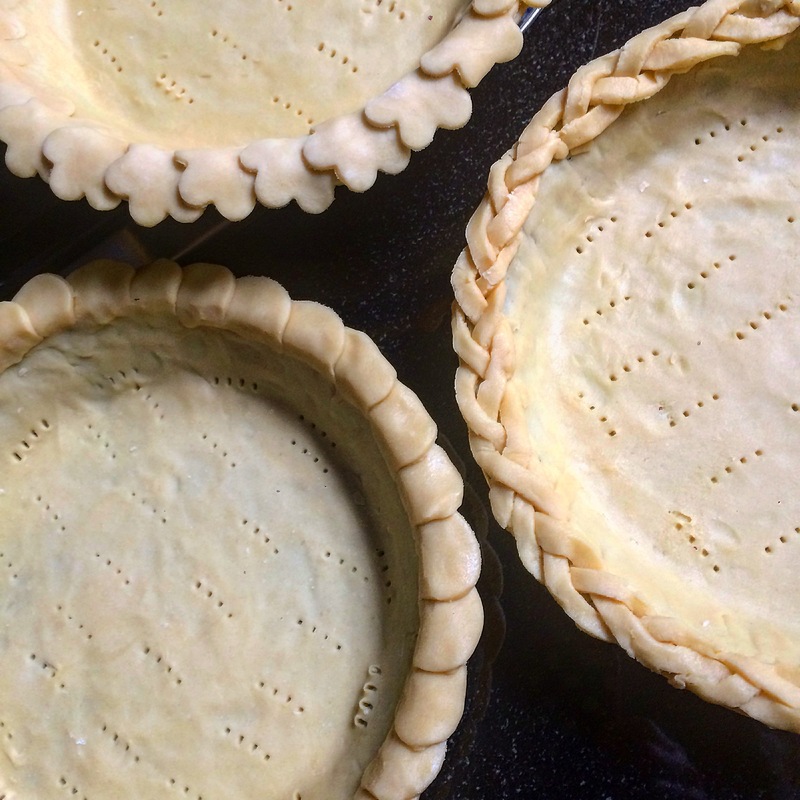 We often make our pie and tart shells a day or two in advance to allow the dough to be firm and cold when we bake them. You can even wrap them well and freeze them for a couple of days. There is no need to thaw them before baking.